Q: What large black beetle has really long antennae and white spots on its back? 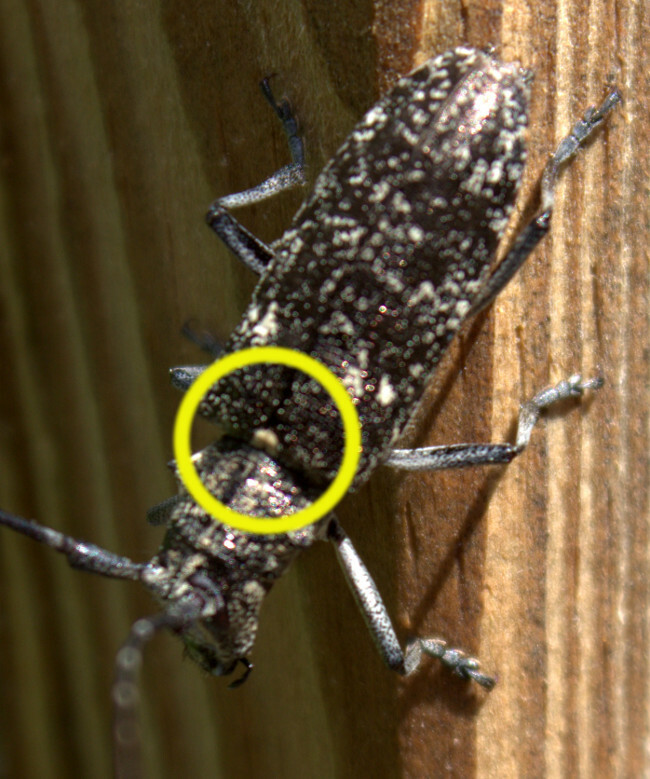 A: The Asian Long-Horned Beetle and its look-a-like the White-Spotted Pine Sawyer. We were sitting out on the deck one afternoon for lunch when a really loud bug flew by. It made a rattling sound that really caught my attention. Was it her wing covers clicking together as she worked her wings to get to her destination? When it landed on the edge of the deck I got these pics. Photos taken 3 June 2014. 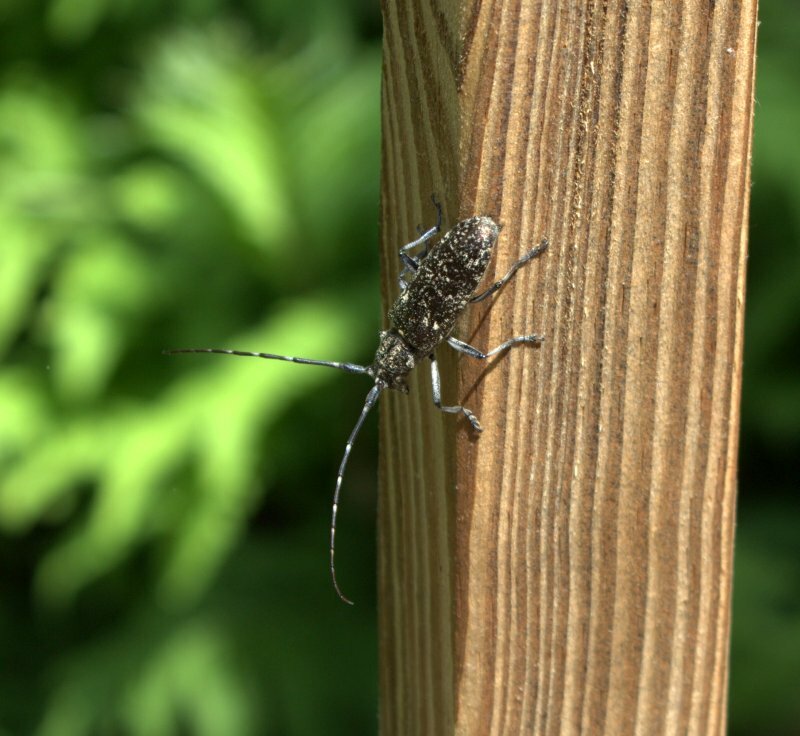 Pine Sawyer resting on a 1 x 1″ deck railing. At first we thought it was the Asian Long-Horned Beetle as the general characteristics seemed right. It was a large black beetle with white spots and long antennae with white bars. The black and white antennae are as long as the body on this female pine sawyer beetle. On further investigation it was learned that this loud black and white beetle was the native Pine Sawyer, Monochamus scutellatus. The defining mark between the two is that the Pine Sawyer has a white scutellum (that little triangular part between the top of the wings – say near the neck) and the Asian Long-Horned Beetle (ALB) has a black one. White scutellum of Pine Sawyer circled at top of wings. Let’s be vigilent! 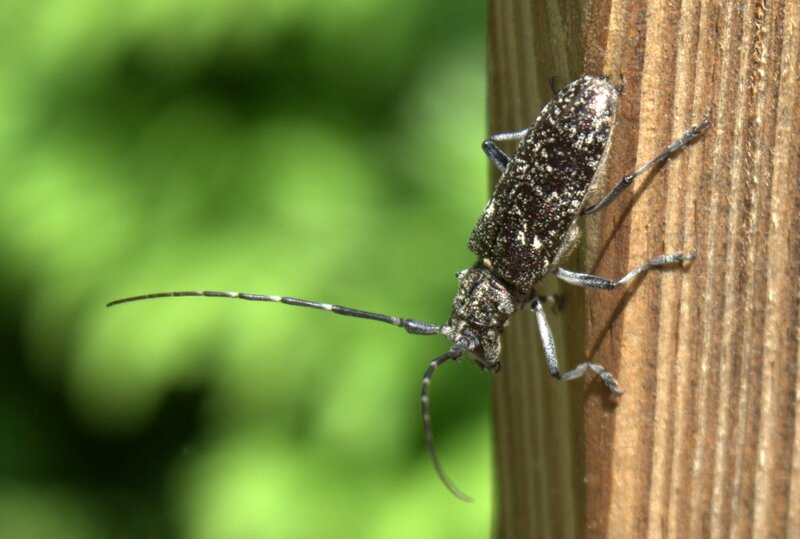 This beetle has the potential to be the pest of the century because it attacks and kills hardwood trees and one of its favorite hosts is the maple tree!